The first running of the Sebring 12 Hours was held back in 1952, when a BMW-powered Frazer Nash driven by Larry Kulok and Harry Grey won a non-championship race. The starting grid included marques we no longer see around, such as Siata, Panhard, Crosley, Cisitalia and Allard, while the circuit was about 43 percent longer than today’s course. Much has changed at Sebring in 63 years, but the 12-hour race maintained its status as one of the world’s most important endurance events. Now bringing together manufacturers like Chevrolet, Ford, Porsche, Ferrari, BMW and Aston Martin, the 12 Hours of Sebring celebrated its 63rd running in 2015, which turned out to be a historic race for the brand that gave us the iconic Corvette and Camaro. 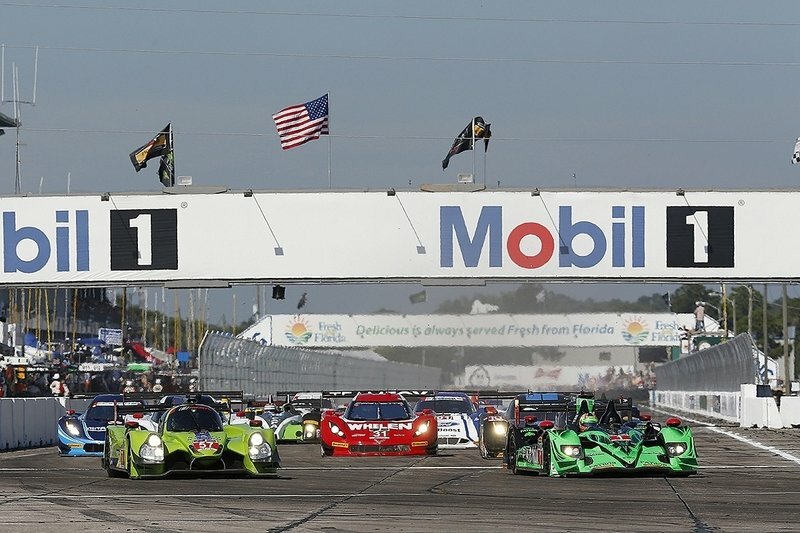 Just like last year’s race, the 2015 12 Hours of Sebring fielded four classes — Prototype, Prototype Challenge, GTLM and GTD — totaling more than 40 cars. The winner completed 340 laps in 12 hours and 1:40.097 minutes, 49 laps more than last year’s winner. There were six cautions, five fewer than last year, over 28 laps. The 2015 race also marked the 50th anniversary of Chevrolet’s lone triumph at Sebring, as Jim Hall II opened the day by running laps in the Chevy-powered Chaparral 2 his father and Hap Sharp drove to victory in the 1965. Keep reading for the full results of the 2015 12 Hours of Sebring. Action Express Racing scored a dominant victory in Saturday’s race, leading a Corvette DP podium. Driven by TUDOR United SportsCar Championship Prototype champions Joao Barbosa and Christian Fittipaldi, along with IndyCar hero Sebastien Bourdais, No. 5 Corvette DP took the checkered flag one lap ahead of the No. 10 Wayne Taylor Racing Corvette DP of Ricky Taylor in second, despite struggling with handling issues in the second half of the race. Joao Barbosa took over the lead from the No. 01 Chip Ganassi Racing Riley-Ford in the eighth hour and, along with the help of co-driver Sebastien Bourdais, extended their lead to more than one lap prior to the sixth and final yellow flag of the race with two hours to go. Action Express Racing also achieved 10,000 consecutive miles of competition during this year’s Sebring and remained the only team to have completed every lap of TUDOR United SportsCar Championship competition to date. The team’s win also marked the second overall victory for Chevrolet at the 12 Hours of Sebring, 50 years since Jim Hall and Hap Sharp won the event in a Chaparral 2 using Chevrolet V-8 power. PR1/Mathiasen Motorsports’s Oreca won the Prototype Challenge tier to secure its second class win of the season following its success at Daytona. Tom Kimber-Smith, Mike Guasch, and Andrew Palmer finished sixth overall, six laps behind the winning car and only 11.6 seconds ahead of the No. 54 CORE Autosport Oreca FLM09 of Colin Braun, Jon Bennett and James Gue. Conor Daly, Jerome Mee and James French droveH the No. 38 Performance Tech Motorsports Oreca FLM09 into third place. Corvette Racing repeated its Daytona victory with Jan Magnussen, Antonio Garcia and Ryan Briscoe behind the wheel after the factory Porsche team’s faced issues in the final two hours of the race. The No. 912 911 RSR had an issue with the left rear wheel, while the second Porsche encountered gearbox problems with only 40 minutes of the race left to run. The No.3 Corvette C7R then took over the lead and a one-minute victory over the Risi Competizione Ferrari 458 Italia driven by Giancarlo Fisichella, Pierre Kaffer, and Andrea Bertolini. The Vette finished 10th overall, 10 laps behind the winning Prototype car. BMW settled for a fourth-place finish with the No. 24 car of Edwards, Luhr, and Klingmann. The No. 25 Z4 GTE, which wore the same livery as the 3.0 CSL that won the 12 Hours of Sebring for the first time in 1975, crossed the finish line in eighth for a disappointing appearance. 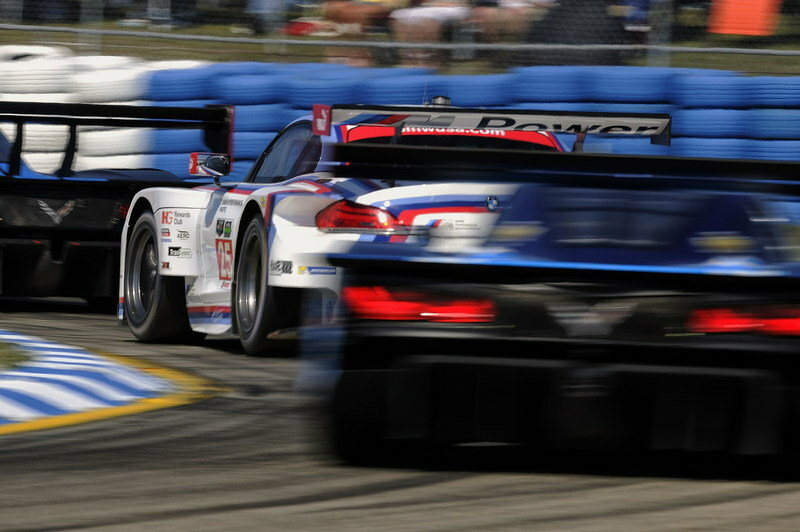 The GTD battle was equally dramatic, with the No. 23 Alex Job Racing Porsche 911 GT America and the No. 33 TI Automotive/Riley Motorsports Dodge Viper GT3-R fighting for the win in the final hour. The Viper was only five minutes from scoring a spectacular win when an engine issue forced Bleekemolen into the pits. That handed the GTD win to the 911 of James, Farnbacher and Riberas, who finished 15th overall, 22 laps behind the winner. The No. 007 Aston Martin V12 Vantage of Nielsen, Davison and Davis crossed the line in second, while the No. 63 Ferrari 458 Italia driven by Sweedler, Bell and Lazzaro finished third. You can find the complete results of the 2015 12 Hours of Sebring here. The 2015 TUDOR United SportsCar Championship resumes on April 18th with the Tequila Patron Sports Car Showcase at Long Beach Street Circuit in California, followed by the Continental Tire Monterey Grand Prix on May 3rd and the Chevrolet Sports Car Classic on May 30th. Endurance racing returns on June 28th with the Sahlen’s Six Hours of The Glen. Five more sprint races are scheduled from July through September, including the Lone Star Le Mans at the Circuit of the Americas, before the Petit Le Mans kicks off. The 10-hour race at Road Atlanta takes place on October 3rd and marks the end of the USCC season. The events at Kansas Speedway and Indianapolis Motor Speedway have been discontinued for 2015.